Christmas is such a joyous time, but can also be sad when we have recently lost a loved one. 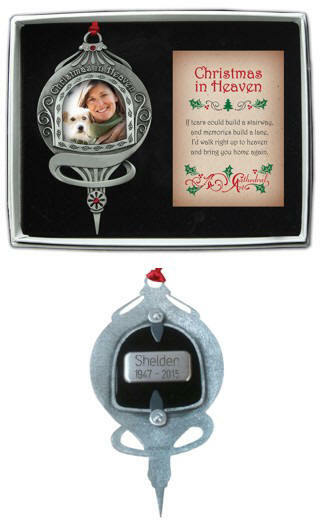 Keep their memory close when you hang this beautiful photo ornament on your tree. Decorated with read and clear crystals, and tied with a red satin ribbon, this beautiful ornament is boxed with a poem card. The poem card reads "If tears could build a stairway, and memories build a lane, I'd walk right up to heaven and bring you home again." Gift boxed. Holds 1 1/2 in. photo. Ornament is 4 5/8 in x 2 5/8 in.